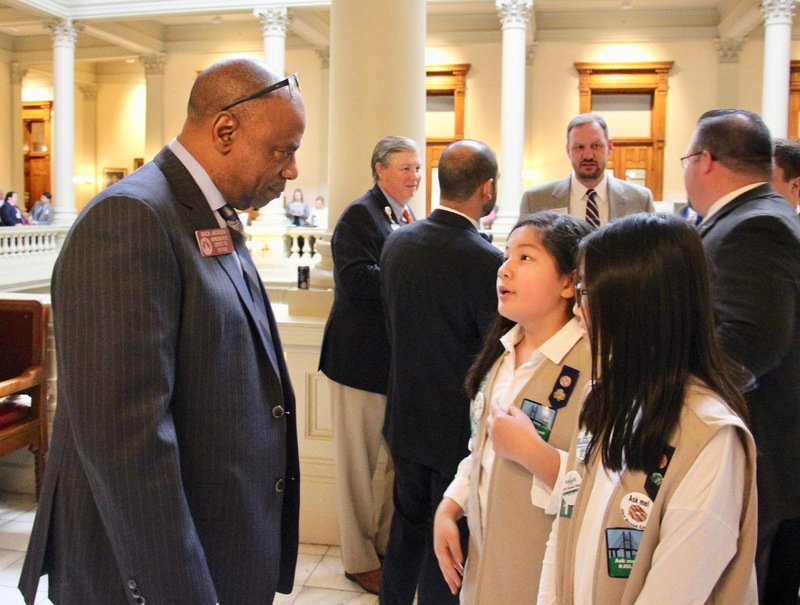 More than 400 Girl Scouts from across Georgia visited the state capitol in Atlanta on February 6 to learn more about the legislative process and have conversations with legislators about naming the iconic bridge over the Savannah River for Girl Scout founder Juliette Gordon Low. Girls and volunteers attended sessions at the Georgia Senate and House of Representatives and met individually with legislators to request support for naming the bridge. Through Girl Scouts, girls learn how to identify issues they care about, stand up for what they believe in, and take the lead with true G.I.R.L. (Go-getter, Innovator, Risk-taker, and Leader)™ grit. Cadettes Ariella from Girl Scouts of Greater Atlanta and Raiyan from Girl Scouts of Historic Georgia were both present at the state capitol. In their own words, they describe their experiences meeting with legislators to ask for their support for the Juliette Gordon Low Bridge. I knew this was going to be a fun day off from school! I also attended last year’s event at the state capitol, and it was a great learning experience. I got to speak with former Minority Leader Stacey Abrams, who is currently running for governor. But this year, there was more on the agenda. Not only were we there to tour the capitol building and sit in the chambers of the House and the Senate, but we also planned to lobby the legislators to officially name the bridge that spans the Savannah River the Juliette Gordon Low Bridge. You might be asking yourself, “How are these young girls between the ages of 8 and 18 going to act as lobbyists and influence how the legislators vote?” It’s simple. Research the facts, prepare an “elevator pitch,” and practice it while being sure to maintain eye contact and not fidget. These are the same skills that successful adult lobbyists must have. I walked to the House chamber entrance and started to “work the ropes.” The time came fast when a legislator approached the entrance. This was the moment! I saw his name tag, which said Josh Bonner. I started by asking him, “What is your FAVORITE Girl Scout cookie?” That was the perfect opening line. Then it was time for my elevator pitch. I told him how important it was to Girl Scouts that the Savannah River bridge be officially named the Juliette Gordon Low Bridge in honor of her work to empower girls. Only after the conversation did I know that it was none other than Mark Strassman of CBS Evening News. He asked to interview me, and I gladly took the offer. I was not nervous at all. It was just as if I was speaking to a legislator. Afterward he told my mom that he was amazed that I was able to speak so clearly about our agenda. He added that we should be sure to watch CBS that night. It was a success! The entire nation will know about Girl Scouts’ efforts to officially name the Savannah River bridge the Juliette Gordon Low Bridge. So you see, our voices do count. We must know the facts and practice, practice, and practice in preparation for the finale. In a way, it is not unlike anything else we do in our lives, such as sports, music, writing, etc. Be confident. People do want to hear our opinions. Let your voice be heard! Juliette Gordon Low, a woman who inspired 18 girls in Savannah, Georgia, on March 12, 1912, created this organization known as Girl Scouts. Little did Juliette know that in under 100 years, the 18 girls would grow to 2.6 million worldwide and become an extremely well-known organization. She was an inspiring person who “built bridges” between people. 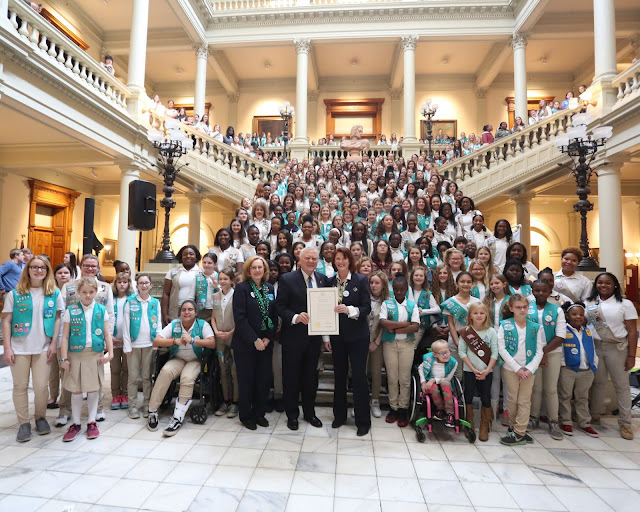 Recently in Atlanta, hundreds of Girl Scouts gathered to advocate for naming the Savannah River bridge in honor of Juliette and her incredible accomplishments. I was among them. 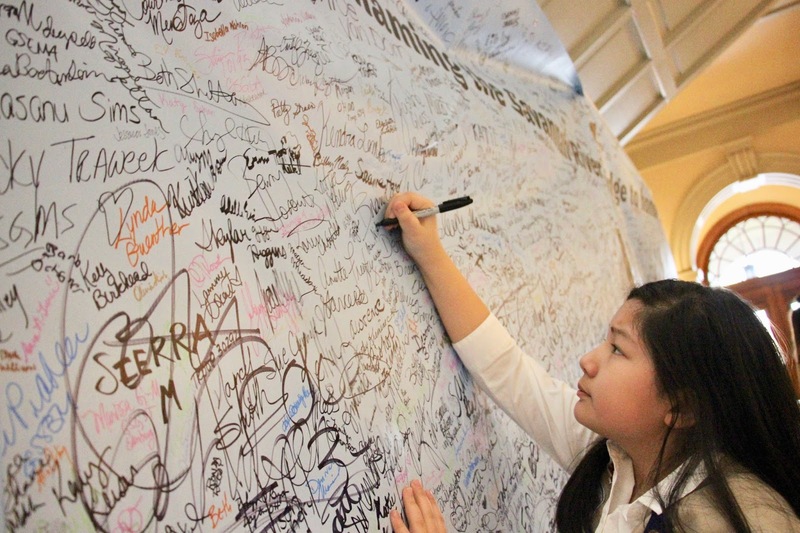 As a third-year Girl Scout Cadette, my experience was something I will never forget. That early morning, there were not many people (yet), and I went to go tour the capitol and learn about how a law is passed in Georgia. A bill (a proposed law or amendment) is first submitted to the House of Representatives by one of its members, where they discuss and vote on it. The same thing happens on the Senate side, but the bills may not be the same. If the House and Senate pass the bill, then both sides come together and try to agree on any differences and what the bill should say. If they agree, both sides send the bill back to be voted on again. If all of that happens, it gets sent down to the governor, who signs the bill and it becomes law. After learning about how laws are passed, I went to Representative Ron Stephens’s office. Surprisingly he invited my sister and me in and listened to our idea about naming the Savannah River bridge in honor of Juliette Gordon Low. 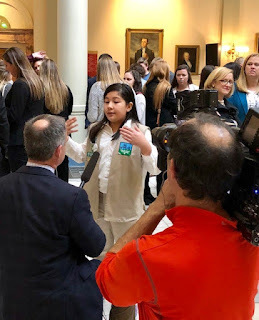 Representative Stephens, like me, is from Savannah, so he was not only in support of us but he had also already written a bill to submit to the House of Representatives that would name the bridge for Juliette! In fact, while I was visiting him, he allowed me to hold the actual bill that they were going to drop into the box in the House Chamber. I continued through the day visiting several other representatives. 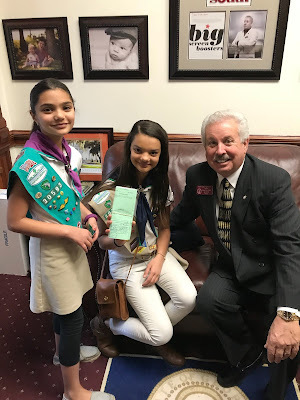 Afterward the other Girl Scouts and I organized a milk and cookies event for the senators and representatives. Many people were being interviewed. Sue Else, the CEO of Girl Scouts of Historic Georgia, was at the event, along with Senator Lester Jackson, who sponsored and submitted a bill on the Senate side. When I was introduced to him so I could thank him for his efforts, he gave me his Senate Medallion. On it was the Georgia crest and motto of “Wisdom, Justice, and Moderation.” He explained how the three columns on the Senate coin held up the Constitution and had the banners with the motto written on them. This idea of justice seemed a natural fit with Juliette Gordon Low’s belief in girl empowerment. In 1912, she opened Girl Scouts to girls of different ethnicities and cultures. She was truly a bridge builder. I do not know if the effort will finally result in having the bridge named for Juliette or if the vote will fail, but either way, I felt empowered by expressing my voice and opinion and having it be heard. I can imagine someday in the future finding myself driving over that bridge named Juliette Gordon Low. At every crossing, I cannot help but think that I would be reminded of how Juliette brought people together from around the world. The thought of me having some part in its naming and honoring someone who helped make me the person I am today makes me feel like I can do anything I set my mind to.